TRACK, MONITOR, AND COLLECT DATA ASSOCIATED WITH LEAK DETECTION AND REPAIR. Krinkle LDAR Tracker is designed to support fugitive emissions compliance requirements on the federal (0000a) and state level. Data collected on the field can be converted to reports instantly and shared with governmental agencies, such as the EPA. Manage and simplify your LDAR compliance program, on and off the field, using our advanced, secure software. Our software will guide your leak detection and repair techs and help them automate the process of LDAR monitoring and maintaining all your critical records while in the field. 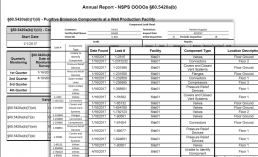 Maintain comprehensive records about the data collected at your well sites & compressor stations, their gas leaks, and the record and status of repair attempts. Comply with federal (0000a) and state regulations by having the ability to generate all required reports for both the government and the site owners . 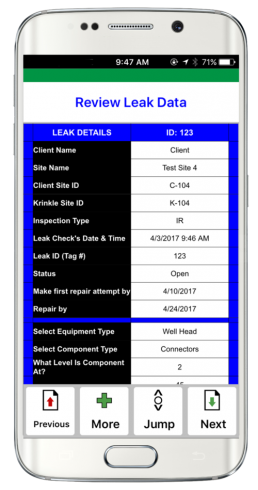 Our reporting tool contains all the reports needed to track all your sites and leaks such as rolling leak logs, component leak logs, remaining leaks, delays of repairs and more. Our reporting tools can be used by third party LDAR service companies or oil companies that choose to self monitor. Keep it simple for your LDAR technicians in the field. Eliminate paper and assign work orders wirelessly to their smart phone device. The work orders are specific to that employee and only work orders assigned to them will be shown in their work queue. 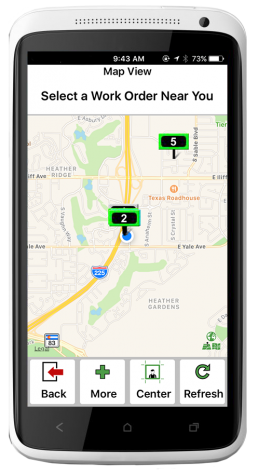 From the app, LDAR techs have the ability to locate their work site, clock-in, document leaks found, document repair attempts, and clock out. Our app has the ability to work for hours, or even days, without a network connection. Data collected in the field will be synced back to the office when a network connection is available. Therefore, redundant data entry will be eliminated and reports will be immediately available. If a leak is detected on-site, our software will provide your LDAR Technicians with all the smart forms and guided workflow processes necessary to document the critical data associated with that leak. Smart forms were created so that subsequent questions are triggered automatically based on previous answers – no time is wasted. This means that your LDAR technicians can complete more visits per day, require less help, and reporting is ready as soon as they complete the job. The system also provides smart forms and greatly simplified guided steps for all repair attempts, delays of repair and more. Our advanced software allows your LDAR field techs to capture images right from their smartphone devices. These images are automatically stamped with date, time, and location. LDAR techs can also draw on these images to more clearly indicate the exact component which is leaking and the direction of the plume as seen only during infrared viewing. We know that the information collected within this industry is extremely sensitive and security of the data is of big importance. Krinkle LDAR Tracker is extremely secure and our security practices have been implemented and tested for years. Krinkle uses SSL certificates signed with a 4096-bit RSA, and hashed SHA-256. In addition, Krinkle applications only communicate using newer secure TLS protocols with HSTS, and strong cipher suites. The LDAR application suite includes everything your company needs to complete inspections and repairs on site. The complete smart form package is designed specifically for your business in the leak detection and repair industry. The Krinkle pricing philosophy is based on simple, activity-based billing and a one-time account setup fee. Only pay for what you use, with no monthly subscriptions. Software-as-a-Service always includes all end-user support and all software updates are included. Our sophisticated smart forms, in coordination with our workflow capabilities, are built to match the needs of the leak detection and repair industry. If required, customization to our already existing platform is readily available, for an additional fee. Our application can be used from mobile devices and/or tablets your employees already own or we can recommend different hardware options for purchase. Generate reports from your PC or mobile device. 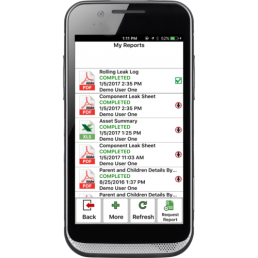 Our reporting tool contains all the reports needed to track all your sites and leaks such as rolling leak logs, component leak logs, remaining leaks, delays of repairs and more. Included are those reports required to comply with state and federal government regulations. Easily provide the government with the required reports at the federal and state level. These reports can be generated instantly and can be formatted how you would like (MS Word, MS Excel, PDF). Run as many reports as you need, at no extra charge. Contains all the required smart forms for managing a wide variety of state and federal LDAR inspections. Inspection requirements and procedures will be accessible from your application. All of our included smart forms act as guided processes for your technicians in the field. Krinkle LDAR Tracker was developed in cooperation with many LDAR subject matter experts (SMEs), who work daily under regulations such as Colorado Reg 7 and the new 0000a federal regulations. Since we charge only once per well site or compressor station inspection, you can have unlimited users. Sometimes, formal reporting output is not what users are looking for. Data Explorer is a simple-to-use, valuable PC tool that allows managers and administrators to easily review and organize all the data coming in from the field, as soon as it arrives. Build and run custom data searches with minimal training. Sorting, filtering and exporting data to excel for any purpose is easily achieved with Krinkle LDAR Tracker’s Data Explorer tool. DOES YOUR COMPANY NEED OTHER CUSTOM FORMS OR GUIDED PROCESSES IN ADDITION TO WHAT'S INCLUDED? Our team can build any number of custom forms in a matter of days. Learn more about our platform technologies. Try Krinkle apps for free for 30 days!